Israel’s Security Agency (ISA or the Shin Bet) statistics show that terror attacks are on the rise, Maariv reported Monday. The cause: resumed peace talks between Israel and the Palestinian Authority (PA). The numbers for November 2013, which were released this week, show the highest number of terror attacks this year: 167, up from 82 in July. Noted terror attacks in November included the horrific stabbing of 19 year-old Eden Atias (z”l) and a staggering 55 attacks in the Jerusalem area – many of which involved Molotov cocktails. The attacks have been rising steadily as talks progress. While only 82 terror attacks were recorded for July, August saw 99 attacks, September – 133, October – 139, and November – 167. December has seen its own share of terror attacks as well. 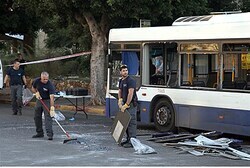 On Sunday, a bus bombing in Bat Yam left 1 injured; Hamas and Islamic Jihad welcomed the bombing as a “response to the crimes of the occupation”. That same day, Israeli police forces thwarted a stabbing attempt at the Mishor Adumim junction. Security officials also say they expect another outbreak of terror in spring 2014, when the discussions are set to either fail or produce an interim deal between Israel and the PA.